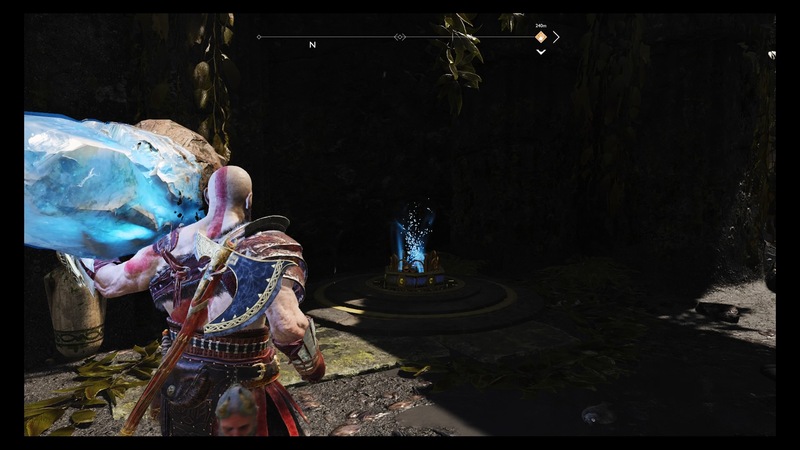 In the shadow of the World Serpent, Jörmungandr, the shores and beaches of The Lake of Nine are home to some of God of War’s rarest items and brain-teasing puzzles. 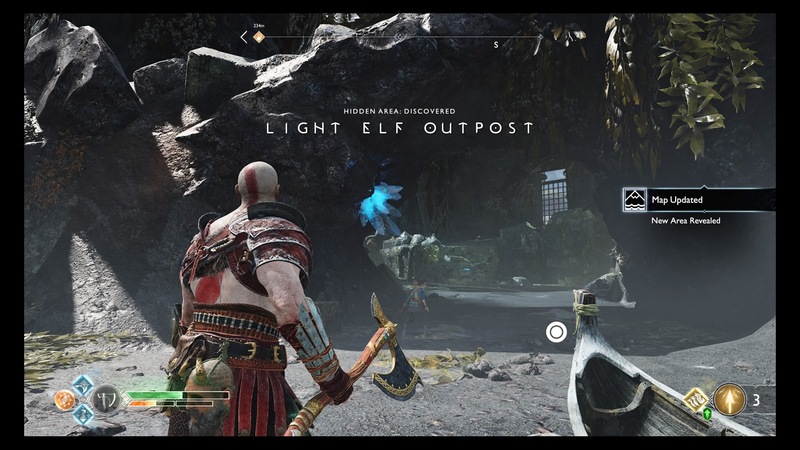 Here’s how to clear the Light Elf Outpost in God of War and get the Pristine Scales of the Realm, as well as open the Nornir chest and claim the final Idunn (Iðunn) apple. 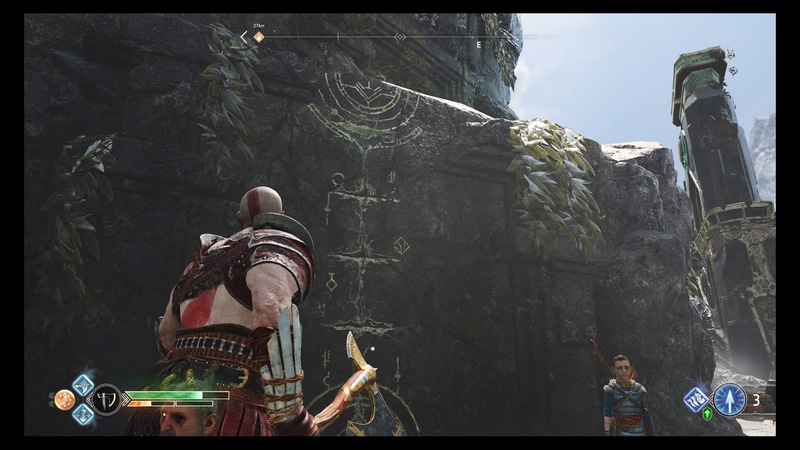 Thought you were done with light bridges and elves when you left Alfheim? They’re back with a vengeance on this small island in the Lake of Nine that becomes available once the water level has dropped for the second time. There are some seriously tough enemies here – level seven and eight to be exact – but there’s a method to cheesing your way through if you’re lower leveled than that. 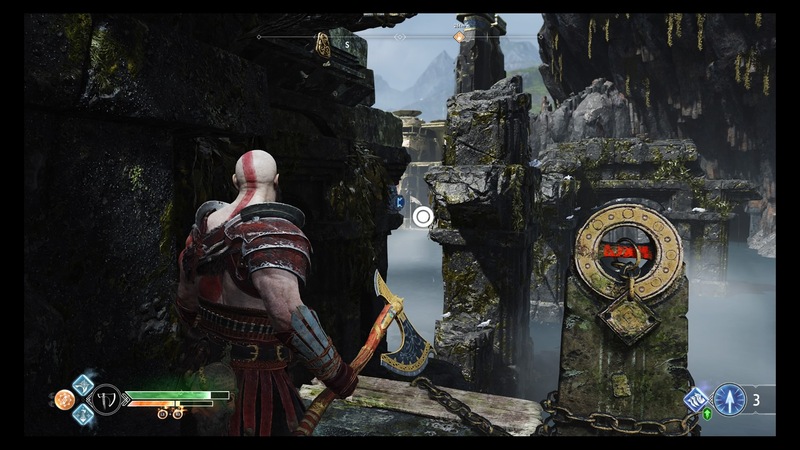 To get to the Light Elf Outpost, travel to the northern part of the Lake of Nine, and dock at the island just past the Helheim tower. 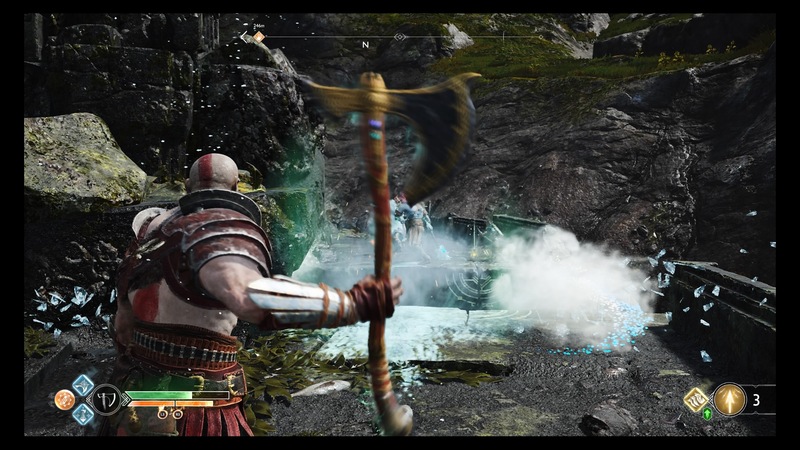 Once you’re on dry land, walk forward into the ruins and you’ll be confronted by an ogre. Use the long beach to your advantage and pepper him with Precision Throw combos. Be careful of his long-range boulder throw attack, but it shouldn’t be too hard to send him back to his swamp. When the beasties are dealt with, saunter into the ruins and break the boards on the other side of the pool directly in front of you. 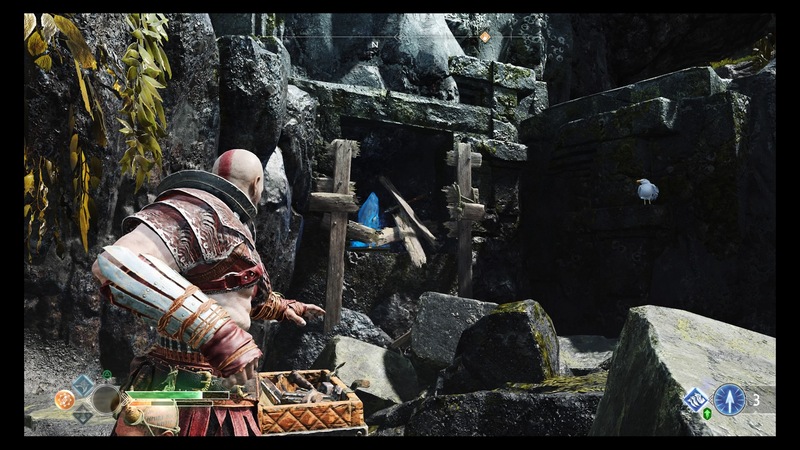 Then shoot the exposed crystal with Atreus’ light arrows to fire up a light bridge. 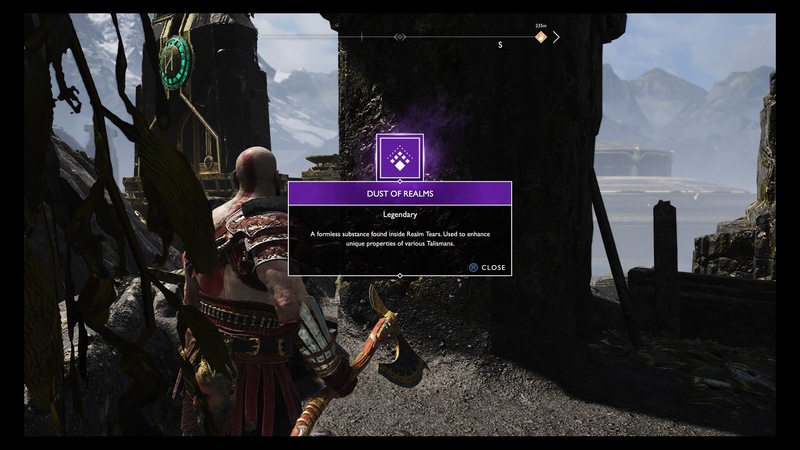 Walk up the bridge to the Nornir chest, face left and break the seal in the distance. Then follow the path around and jump over the gap. Turn left on the other side, then left again when you’re outside and drop down the chain. Press forward a few steps and you should be attacked by a heavy Hel-walker. Deal with him before following the path around to the left. Destroy the boards you can see over the rocks, then shoot another light arrow at the newly revealed crystal. Go back to where you came from and break the boards to the right of the chain. You should see a small room with a crystal and a gate. Open the gate, but leave the crystal where it is for now. Next, scale the climbable wall to the right of the crystal room you just opened. It’s outside near the chain. At the top, open the gate in front of you by cranking the chain but don’t go through. Turn right and go around the corner. You should see some fire throwing enemies. Kill them. 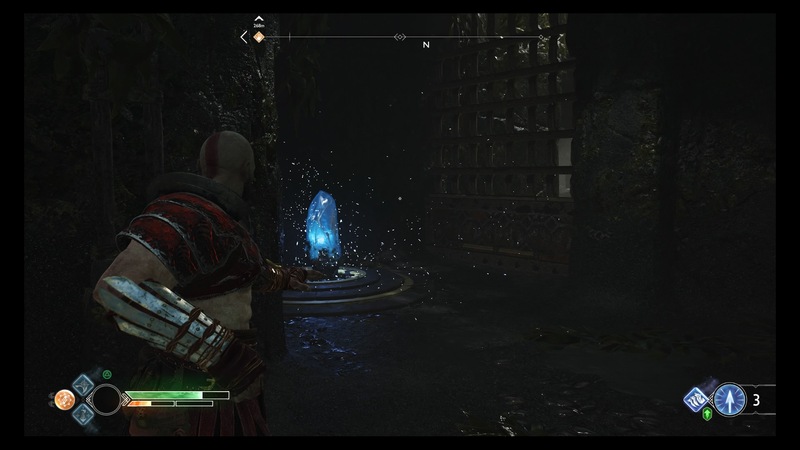 Now go back through the gate you just opened – it leads into the first room you entered – and collect the crystal you found on the bottom floor. Retrace your steps through the gate again, then where you killed the fire throwers bear right and follow the path. At the end there will be a slot for the crystal. Place it in and shoot it with a light arrow. Turn around, go back down the path and turn right at the end so you take the path that’s parallel to the one you were just on. 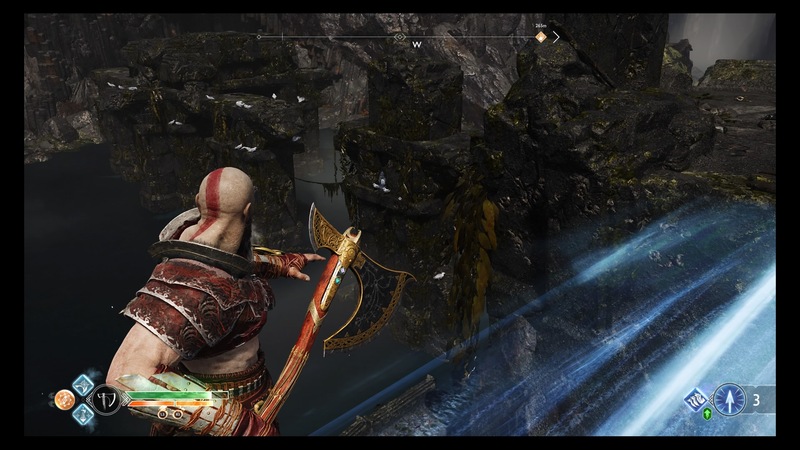 When you reach the light bridge, look left and shoot a light arrow at the crystal you can see high in the distance. Continue forward, kill the enemies that appear, then jump the gap. 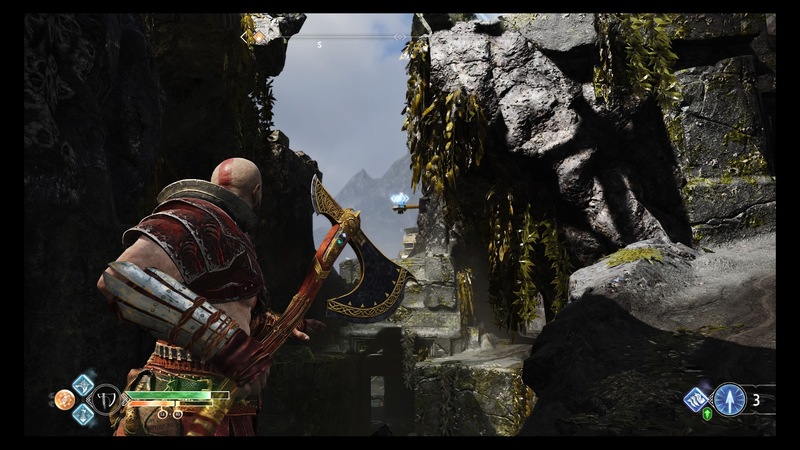 Press on around the corner, then when you reach the second light bridge look left again and shoot the crystal you can see in the distance. 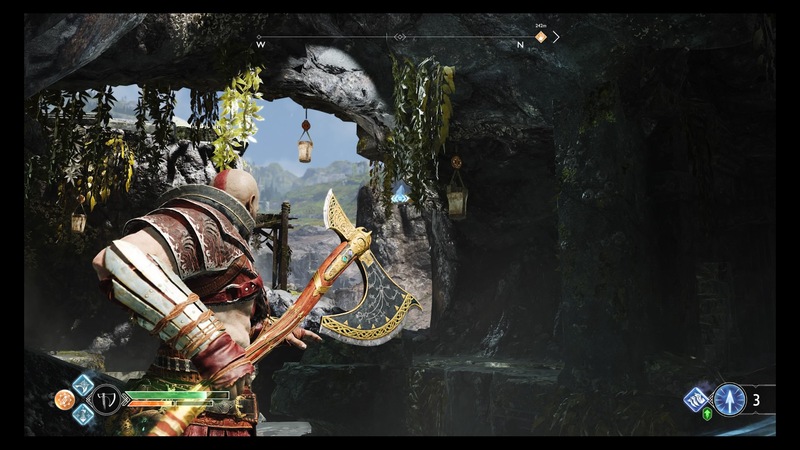 Follow the path to the end, then throw your axe at the seal off the edge next to the chain. 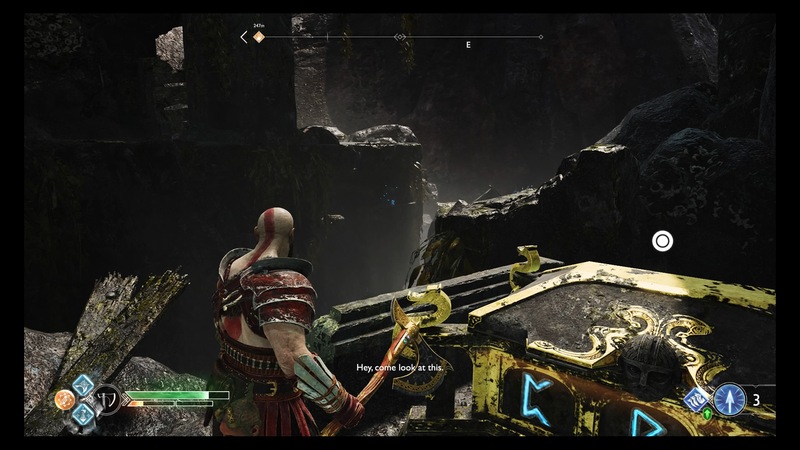 Now climb up the wall and kill the two shield-walkers and fire-throwers that attack you. Shield-walkers are quite vulnerable to shock arrows, so use that to your advantage. 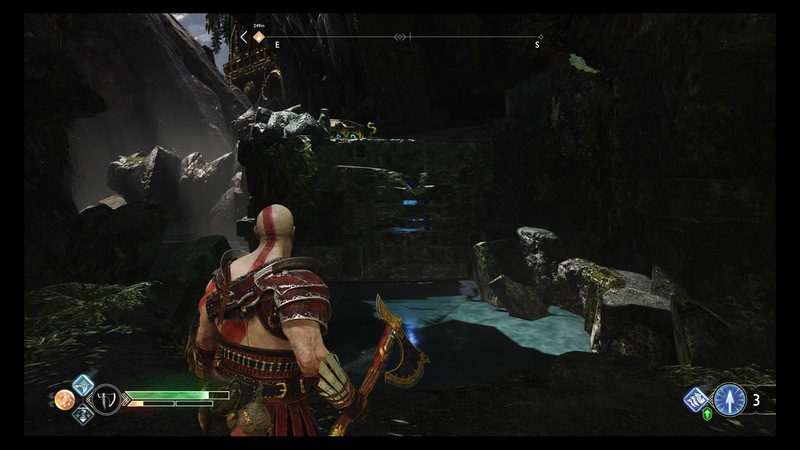 From where you climbed up, bear right onto the light bridge, then face right and break the final seal in the distance. Continue across the bridge and follow the path around before opening the gate on your left. 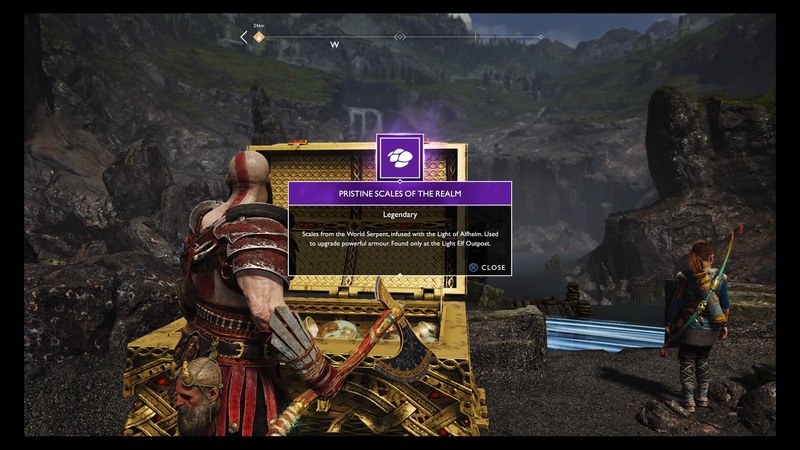 Open the large chest in this clearing and claim the Pristine Scales of the Realm – a powerful upgrade item you can’t get anywhere else. Turn around and go back out of the gate and turn left. Drop down the ledge and follow the path around, jumping the gap in front of you. 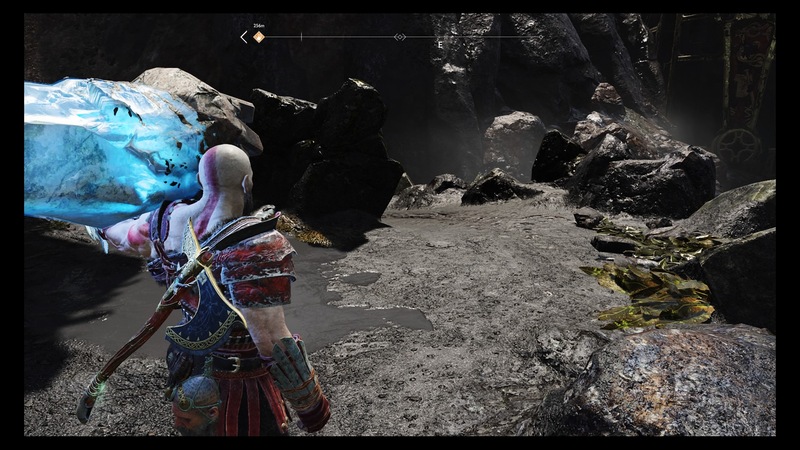 Grab the crystal that you find along this route and continue walking around until you get back to the room where you found the Pristine Scales. Place the crystal in the slot in this room and shoot it. This will open a realm tear. This is a tough fight if you’ve arrived at the Light Elf Outpost as soon as it becomes available. If you’re one Idunn Apple away from a health boost, nip downstairs and open the Nornir chest – which contains number nine of nine if you’ve been diligent with collecting them – before you reach into the tear. Otherwise, open the tear and back off immediately. From the rift two level seven heavy Hel-walkers and one level eight Shield-walker will emerge. All of these enemies are very slow moving, so if you continually back off and pepper them with axe throws, you can wear them down. As you back out of the gate, turn left down the light bridge so you’ve got a clear line of site and continue to throw you axe at the enemies. Start with the heavy enemies because they’re most vulnerable. Keep kiting the enemies around the perimeter of the outpost, jumping across and climbing up the ledges in plenty of time. Once the heavy Draugr have fallen, turn your attention to the Shield-walker. He’ll be resistant to your regular axe throws, but there are a couple of things you can do. Aim for his feet and you’ll trip him up. Once he’s on the floor, spam as many ranged attacks as you can muster. 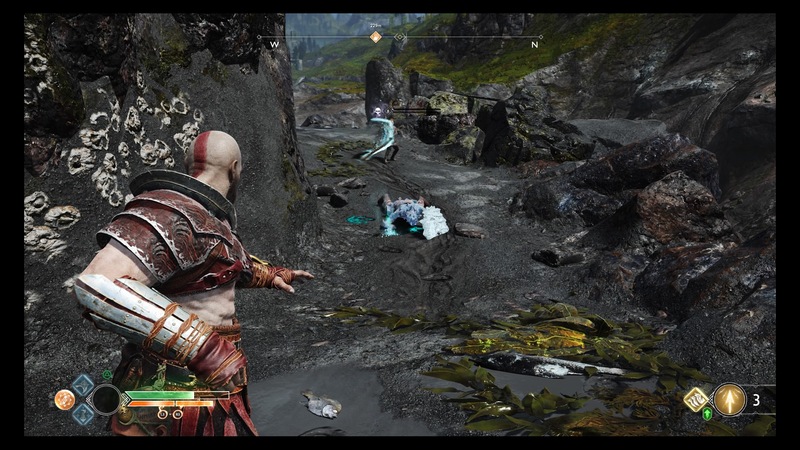 At the same time, make use of Atreus’ abilities. 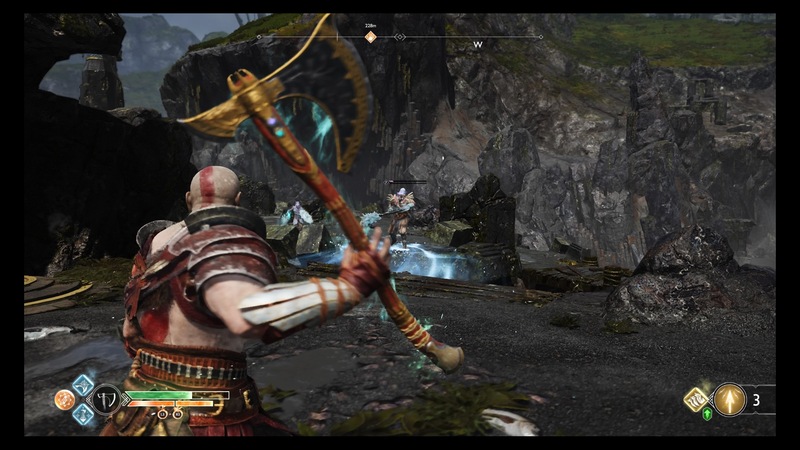 Spam shock arrows whenever they’re available and take the chances you’re afforded when he grabs the walker with a melee attack. Keep kiting him around, and eventually you’ll prevail. The whole process took us around ten minutes. Victorious, return to the tear and claim your Dust of Realms. You’ll get some other items and resources as well. Remember to return to the bottom floor and open the Nornir chest to get your Idunn Apple.